From a hardware perspective, there’s not a lot missing when you compare the ZenPad 3S 10 to the new 9.7-inch iPad. Even the price is similar, although Asus’ tablet is cheaper. It’s also thinner, and performs just as well in most tasks. People aren't buying tablets at the same rate they were a few years ago. Because of that, manufacturers have responded by simply releasing less product. But that doesn't mean there aren't new and exciting options. For iOS users, there's the latest iteration of the iPad. 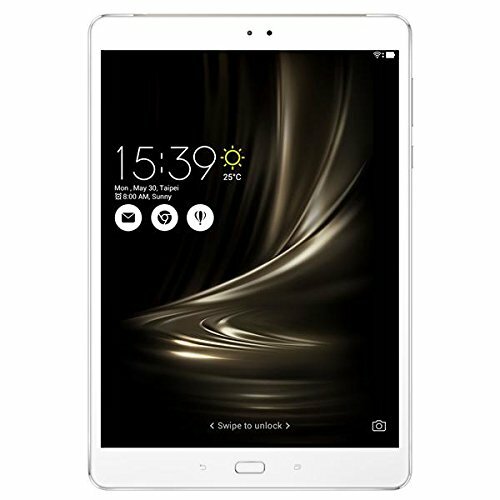 For Android fans, the most direct competitor in features and price is the Asus ZenPad 3S 10 – an attractive and slender metal tablet with enough about to keep most buyers content, without costing a fortune. With a drought in Android tablets of late, is Asus the company to offer the only sensible iPad alternative? The Asus tablet is slimmer and lighter than its Apple-branded competition. It also happens to be a few millimeters narrower. All this is easily noticeable when you hold them side-by-side. By comparison, the ZenPad is easier to hold for longer periods. The look of the ZenPad 3S, at least from the front, is a fairly standard affair. Its 9.7-inch display is framed by the bezel which looks similar in size to the standard iPad's. There is, however, a big difference in design: on the bottom bezel, there's a rectangular home button – which is where the fingerprint scanner lives – flanked by capacitive back and recent apps buttons. That fingerprint scanner is up to current standards, able to register up to five fingerprints and responsive in unlocking the tablet when applying a registered finger. It makes using the tablet far quicker than needing to mess about with PIN or pattern. Surrounding this bezel is a metal frame which is polished and forms the edge of the rear panel, a design which is mirrored on the underside of the tablet. That means there's visual contrast, separating these slim and curved edges from the front and back. Three of four of them are finished in the same bead-blasted, soft, anodised texture as the metal back panel. The only exception is the top edge, which has a plastic panel designed to mimic the look of the other metal edges. The ZenPad 3S 10 features a microSD card near the top of the left edge, while the volume rocker and power/sleep key on the right. The USB Type-C port is joined by speaker grilles on the bottom edge. Taking another leaf from the iPad's book, Asus has opted for a 1536 x 2048 resolution display, spread over a panel that measures 9.7-inches diagonally. That gives it a pixel density of 264 pixels per inch, which may not seem like much compared to the 400ppi and up that we see on modern smartphones, but is actually fairly standard in the tablet industry. And it looks just fine. As screens go, the LCD IPS panel on the ZenPad 3S 10 is decent. Colours are vibrant enough to make gaming and watching movies enjoyable, while wide viewing angles mean you don't have to sit with it facing directly at you to get a good experience. Being an LCD panel, you naturally won't get the intense contrast levels and high saturation of an AMOLED screens, but it's still pleasant enough. As with most modern tablets, the size and aspect ratio of the display isn't perfect for video. It's meant to be a canvas suited for as many tasks as possible, such as reading the morning paper, and that means you will get letterboxing on all of your 16:9 or (roughly) 18:9 videos on YouTube and Netflix. Not the end of the world, but something to take note of if you're buying one solely to watch the latest and greatest boxsets. At its base, the tablet's software is Android 6.0 Marshmallow, but it's running Asus' heavy skin on top which - while still clearly Android - looks vastly different once you open up settings and menus. If there's any way to describe this custom software, the most positive way would be to say that Asus likes to offer lots of options and added features. Another way to describe that would be to call it bloatware. When using the ZenPad 3S, dropping into the quick settings shade reveals an all-white menu with big, brightly coloured round settings toggles. These are the usual collection of airplane mode, Wi-Fi, Bluetooth and Do Not Disturb, among others. Notable inclusions are the Bluelight Filter, which cuts out blue light from the screen to relax your eyes in the evenings, and the AudioWizard, which lets you customise the equaliser of the headphone output to suit whatever you're watching/listening to. With most Android devices a long press on the homescreen wallpaper will deliver three to four simple customisation options, Asus provides eight, plus a "more" option. These including launcher themes, icon packs and wallpapers, as well as more detailed customisation options. As an example, Preferences provides access to an endless number of options to change the way you interact with, and see, items on the home screen. You can change the grid size of the app icons, change the transparency of various UI layers, adjust the blur and scroll effects, plus much more. And that's just in the Home Screen section of the Preferences menu. For parents, the most useful added option is Kids Mode. This lets you launch a completely different user interface, with only the apps you've chosen as safe for your kids. You can even add in a time limit, so the lil'uns can't use the ZenPad for longer than you've decided is appropriate. Then there are pre-installed apps, which include the usual selection of Asus mobile programs. Apart from the usual calendar, clock, gallery and file manager there's a PhotoCollage app that lets you make photo grids, 360-degree collages, magazines, your own stickers and add effects to photos. Similarly, the MiniMovie app lets you make videos from photos and footage from your gallery. That's not all. There are yet more apps. Asus has never been shy about loading up its Android devices with extra software. SuperNote, System update, Do it Later, ZenUI FAQ and ZenCircle are among the others. We think almost all of the apps should be optional, uninstallable extras, or just options within the settings menu, rather than pre-installed from the off. One element that may seem visually minor, but made a big impression on us, was how the notification shade drops down when you swipe positionally on the screen. So if you're swiping down with your right hand near that side of the display, the drop down box appears nearer to the right edge. If you swipe in the center, it drops down in the centre, as relative. For the most part, the ZenPad 3S 10 handled pretty much everything we could throw at it without struggle. Not surprising, given Asus has opted for an octa-core MediaTek chipset, paired with 4GB RAM. In all the games we played, web pages we browsed and apps we opened, the tablet handled it all without so much as a whimper. It may not be as zippy fast as an iPad, but it was reliable and consistent, with only minor stuttering on occasion, which is something we've experienced with most devices running a similar spec. One slight issue we had seemed to revolve around video streaming. Much of the time we watched video on any of the popular streaming services, the video seemed a little rough around the edges, and often wasn't smooth. This is quite normal when you first begin a stream, but will usually catch up as it buffers to produce smooth HD-quality video. Except that initial buffering seemed to last longer than usual, and it wasn't as pin-sharp as we're accustomed. Downloaded content worked better, in terms of sharpness, but we still experienced some minor glitches during video playback. Having tried YouTube, Google Play Movies, Netflix and iPlayer, it seemed iPlayer was the one with consistently decent quality. Asus promises 10 hours use from the internal 5,900mAh battery, but actual usage in our testing came short of that. As with any device, the battery performance depends on how you use it. If you're binge-watching video with the brightness set to 100 per cent, you'll likely drain the battery flat within four hours. It's a similar story with gaming: we played Lego Star Wars for around an hour and watched 20 per cent battery drop, meaning around four to five hours of use. For average mixed use, however, using the ZenPad a few times a day, you shouldn't have to plug it in more than twice in a week. Unless this is your family tablet and it's used for constant streaming, in which case we'd suggest investing in a Quick Charge 3.0 power adapter for it because, although the ZenPad 3S 10 supports QC 3.0, the adapter included in the box doesn't. While camera isn't the top priority in a tablet, it's nice to have one that's so feature rich in the ZenPad. As well as the usual Auto, Panorama and HDR modes, there's time lapse, slow motion, and a night mode, among many other features. Image quality isn't top notch, but it's good enough for taking casual shots and sharing them on social media. Colours are natural enough and detailing is good when shooting in daylight conditions. We did find that it oversaturates greens a lot, however, and had a hard time balancing exposure levels. There's also a Depth of Field mode which adds generous background blurring to photos, similar to the Portrait Mode on the iPhone 7 Plus. It takes a photo, focusing on a close-up object, then takes a second photo focusing on the background, and uses that to add background blur, which you can increase or decrease. Probelm is, as with so many of these software-based solutions, it simply doesn't work very well - or, at the very least, is fussy about the content of the image. The only blemish is the software. Not only is Android still behind iOS in the app games department, Asus has loaded the ZenPad with so many un-installable apps and extra functions, that it can almost be overwhelming. We had some stuttering playback issues too, while the Depth of Field mode in the camera doesn't work very well. On the whole, however, this is a solid £300 tablet without any major problems. We'd still recommend the new iPad as the safer option for purchasing, but if you don't like Apple or don't want to use iOS, then there aren't many savvy options that offer the value for money that this Asus tablet does. Apple's latest iPad is the most direct competitor to the Asus tablet. It may not have all the extra features that the ZenPad 3S 10 has, but it makes up for it in reliability, battery life and all-round performance. It's still the best tablet for most consumers in the 10-inch/£300 category. Samsung's latest Android tablet is virtually double the price of the Asus tablet, but is a big upgrade in performance and features. The AMOLED display is fantastic, and the S Pen addition is truly very useful. There's no doubting that it's more of a direct competitor to the iPad Pro series, but if you're after one of the best Android tablets, money no object, the Tab S3 is certainly a good option.